Crumbly cookies with sweet surprise inside! Raisins and brown sugar give these classic treats a deep and rich flavor. 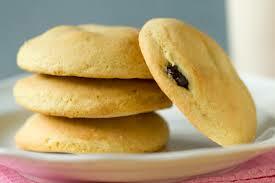 Here is an easy dessert recipe for Raisin-Filled Cookies. Cream sugars and butter in a large bowl. Add eggs, one at a time, beating well after each addition. Beat in vanilla. In a separate bowl, combine the flour, baking powder, baking soda, salt and nutmeg; add to creamed mixture alternately with buttermilk. Cover and refrigerate until easy to handle. To make the filling, combine the cornstarch, flour and brown sugar in a saucepan. Add in water and stir until smooth. Add raisins. Bring to a boil over medium heat; cook and stir and cook for 3 minutes or until thickened. Cool. On a floured surface, roll out dough into 1/8-inch thickness. Cut with floured 3-in.-round cookie cutters. Spoon 2 teaspoons filling on top of half the circles and top each with another circle. Pinch edges together and cut slit on top. Place 2 inches apart on ungreased baking sheets. Bake at 350° for 10-13 minutes or until lightly browned. Remove to wire racks to cool.